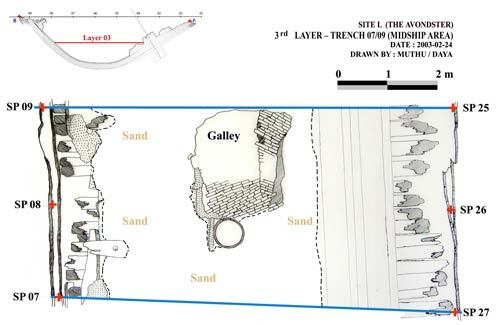 The Avondster site was identified by the Galle Harbour Project in 1993, with small-scale excavations in 1996-99. 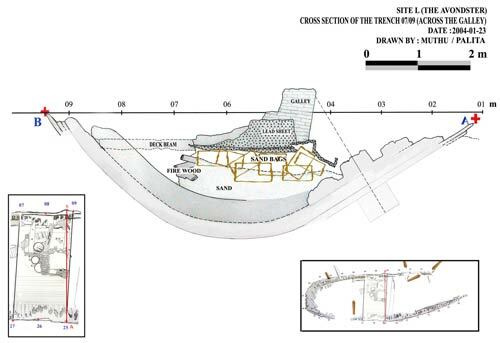 In 2001 the Avondster Project started, excavating the bow section in 2001-2, before moving to the area around the galley. From November 2002, the 4-metre wide Trench 07/09 across the centre of the ship was fully excavated. Survey points fixed in November 2001 were stainless steel rings fixed to the hull timbers. 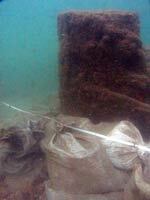 These were replaced in November 2002 by ten aluminium poles driven vertically into the seabed outside the site. 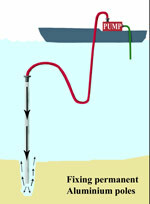 The poles were 4 metres long, driven into the seabed to a depth of 2.5 metres with the aid of a water pump. WEB IT survey software was used until late 2002, when it was replaced by Site Surveyor. 3-horsepower Robin water pumps used initially to power the water dredge were not powerful enough, and needed frequent repair. In late 2003 a 5.6-horsepower Robin water pump was purchased, making excavation easier and faster. 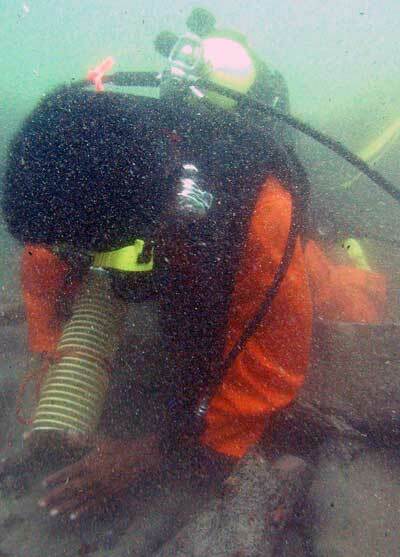 The photo shows a diver hand-fanning while using the dredge to clear silt from the excavation area. 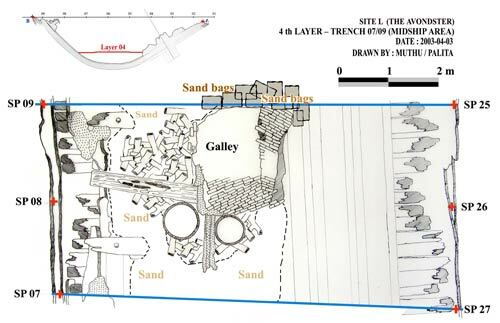 The trench excavation started with the removal of sand. As excavation progressed to the third layer, there was a danger of destabilising the galley, which was accordingly supported by sandbags. 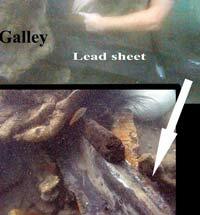 Some lead sheeting found under the galley was bent into a shape like a gutter and may have served that function. It was nailed to a wooden pole for support. 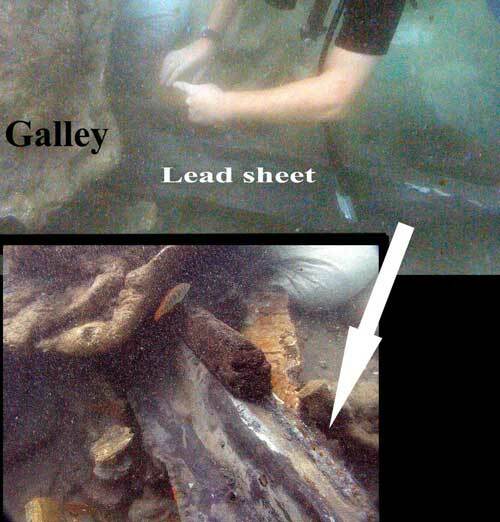 Barrels were found one above the other in the third to fifth layers of excavation. 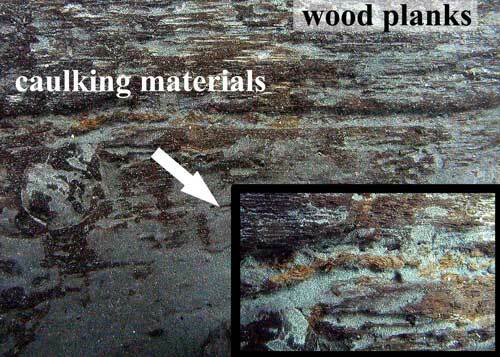 Caulking could be seen between planks of the lower deck in the fourth layer. 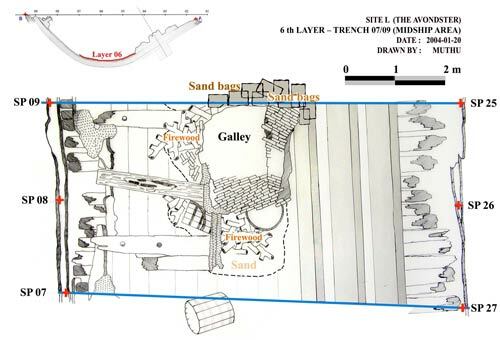 In the fourth and fifth layers was a large amount of wood, which could have been firewood to feed the galley, or dunnage to prevent barrels from rolling. Each piece was tagged underwater and brought ashore for sampling, before being reburied near the site in case required for further research. 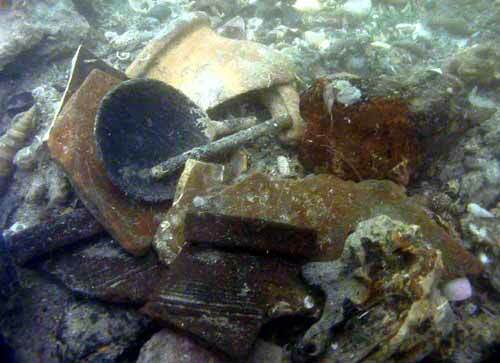 A trench extension outside the starboard hull revealed many pottery shards in the second layer, along with clay pipe pieces and a chank shell.